We have been overrun in the kitchen with little cockroaches in the cupboard. Every time we get out the plates, we have to brush off the black sprinkles from everything. I decided it was time to clean out. As there is no such thing as cockroach baits here, I took out everything and sprayed with insect spray. All the disgusting little creatures were hiding on the top of the inside of the cupboard. Well it was really raining cockies. I was feeling pleased with myself. The next day, black sprinkles back on the plates. Guess we will have to live with it. It is said that new missionaries who find a fly in their tea, throw out the tea. After a few months, they take out the fly and drink the tea. After more months, they drink the fly in the tea. 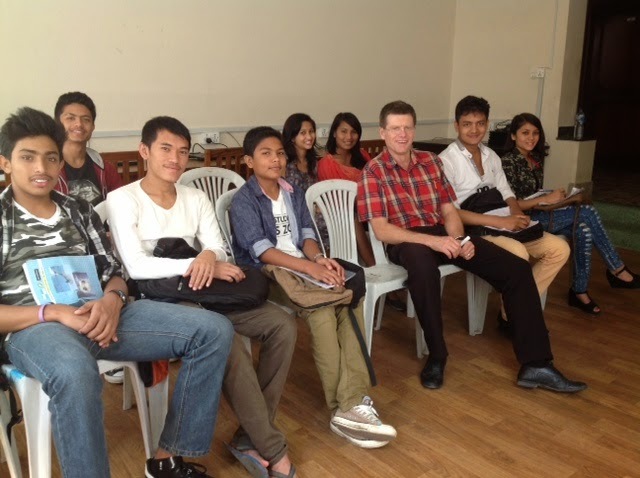 Peter above , with ESL class of keen young people trying to master english. Below the girls in the last stages of doll making. Robyn.